Black and white Americans have profoundly different views on racial equality, and a new survey finds they also differ on the extent to which a person’s race can be a burden or a benefit. For blacks, the answer is clear: 65% say “it is a lot more difficult to be black in this country than it is to be white.” Fewer than half as many whites (27%) agree. The racial gap in perceptions of white advantages is even starker: 62% of blacks say “white people benefit a great deal from advantages in society that black people do not have.” Just 13% of whites say whites have benefited a great deal from advantages that blacks lack. The survey was conducted June 7-July 5 among 4,602 adults on Pew Research Center’s nationally representative American Trends Panel. Among Hispanics, 37% say it is lot more difficult to be black than white, which is higher than the share of whites who say this but far lower than the number of blacks who do so. Most Hispanics say white people benefit from advantages in society that blacks do not have; 33% say whites benefit a great deal from these circumstances, compared with 62% of blacks and 13% of whites. The differences in attitudes on racial advantage are partisan as well as racial and ethnic. In the new survey, registered voters who support Hillary Clinton and Donald Trump diverge substantially in their views of the difficulties blacks face and the advantages that whites possess. 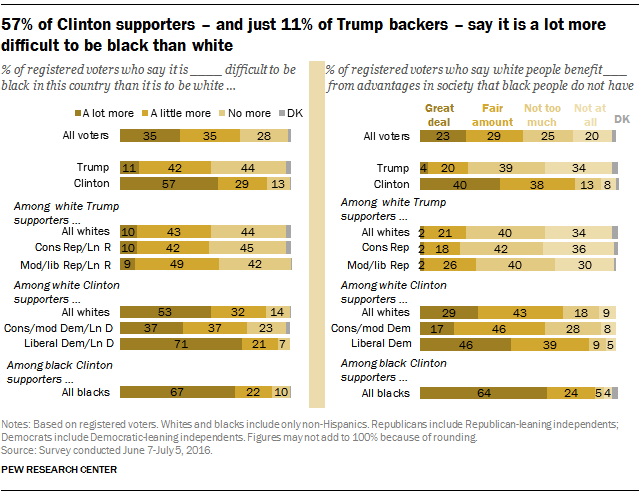 Nearly six-in-ten registered voters (57%) who support Clinton say it is a lot more difficult to be black than white, while 29% say it is a little more difficult and 13% say it is no more difficult. Among Trump supporters just 11% think it is a lot more difficult to be black than white, 42% say it is a little more difficult and 44% think it is no more difficult. Most Clinton supporters (78%) think that white people benefit either a great deal (40%) or a fair amount (38%) from advantages that blacks do not have. Just 4% of Trump supporters believe whites derive a great deal of benefit from their race and another 20% say a fair amount. Clinton supporters are divided racially and ideologically on both questions. About half of white Clinton supporters (53%) say it is lot more difficult to be black than white; that is less than the share of black Clinton supporters who say this (67%). However, just 10% of white Trump supporters say it is much more difficult to be black than white. Among white Democratic voters who back Clinton, liberals (71%) are far more likely than conservatives and moderates (each 37%) to say it is much harder to be black than white. The views of white liberal Democratic supporters of Clinton are nearly identical to those of black Democrats, 67% of whom say it is a lot harder to be black than white. The patterns are different in perceptions of white advantages. Nearly two-thirds (64%) of Clinton’s black Democratic supporters say white people benefit a great deal from advantages blacks do not have; just 29% of her white Democratic supporters agree. Among Clinton’s Democratic supporters, more white liberals (46%) than white conservatives and moderates (17%) say whites possess major advantages that blacks do not. Yet white Trump supporters are far more skeptical than any group of white Clinton supporters to say that whites have a significant edge because of their race. Just 2% of white Trump supporters say white people benefit a great deal from advantages that blacks lack. Looking specifically at perceptions of how blacks are treated in different areas, a recent survey found that majorities of blacks say black people are treated less fairly than whites in dealing with police, in the courts, when applying for a loan or mortgage, and in the workplace. And at least four-in-ten say blacks are treated less fairly in stores or restaurants or when voting in elections. On all of these items, blacks were at least 20 percentage points more likely than whites to say blacks are treated less fairly. Whites, in turn, were more likely to say both groups are treated about equally.